Anthracnose of figs is a fungal disease that causes rotting and shriveling of the fruit on fig trees. The infection also impacts leaves and causes defoliation. This disease has the potential to cause serious damage to trees, especially when it is poorly controlled year after year. Preventative measures and cultural control are important for protecting a fig tree in your yard from anthracnose. Fig anthracnose is a disease caused by the fungus Glomerella cingulata. It attacks the leaves and the fruit of fig trees. Fig anthracnose symptoms include fruit that rots and drops prematurely as well as immature fruit that shrivels and never drops from the tree. The fruit will have sunken spots that are discolored. As the diseases spreads, these spots will develop pink spores. On the leaves, anthracnose of figs causes a margin that is dark brown in color surrounding spots that are slightly sunken. With time these spread and merge, producing large areas of brown on the leaves. The leaves tend to develop a dry, brown margin all around the edges and eventually fall off the tree. 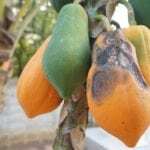 There is no fig anthracnose treatment with chemicals that will successfully eliminate the disease and maintain edible fruits. Prevention and good management are used to control the disease and prevent it from destroying trees and crops. A healthy fig tree with the right conditions will better resist diseases like anthracnose. These trees need full sun to partial shade, soil that drains well, and a warm climate to thrive and stave off disease. Wet conditions can be tolerated by fig trees but make them more vulnerable to fungal infections. Avoid overhead watering and standing water. Despite preventative efforts, you may see fig anthracnose symptoms on your tree. If you do, remove all branches that are affected and destroy them appropriately. Keep the area under the tree clean and free of debris, especially the infected parts of the tree that have been trimmed. With these steps and by keeping your fig tree healthy, you should be able to manage the disease and save your tree and much of your fruit crop.